South African Airways (SAA) is continuing attempts to turn around its long-haul operation by switching, in Aug-2015, the stopover point on some of its Washington Dulles flights from Dakar in Senegal to Accra in Ghana. SAA expects strong local demand for the new Accra-Washington leg compared to virtually no local demand for Dakar-Washington, which should result in a significant improvement in its US operation. In Mar-2015 SAA made an initial two major steps in restructuring its long-haul network by suspending services to Beijing and Mumbai while launching services to Abu Dhabi as part of an enhanced partnership with Etihad. SAA’s long-haul operation, which has been highly unprofitable in recent years, also has seen significant improvements due to lower fuel prices and lower aircraft leasing costs following the extension of A340 leases at lower rates. But SAA still faces challenges as it tries to complete a difficult to achieve turnaround of its long-haul operation. SAA will need to ultimately acquire new generation widebody aircraft, which it has delayed multiple times. SAA will likely now keep at least a portion of its A340 fleet operating until at least 2020, a potentially risky decision should oil prices rise again. SAA began implementing a long delayed turnaround plan in early 2015, when it announced the suspension of thrice weekly services to Beijing and Mumbai from end Mar-2015. At the same time SAA launched daily services to Etihad’s hub in Abu Dhabi, which SAA now uses to provide offline access to more than 30 cities including several in India. Abu Dhabi is now one of nine long-haul destinations for SAA along with London Heathrow (double daily), Sao Paulo (10 times weekly), Frankfurt (daily), Hong Kong (daily), Munich (daily), New York JFK (daily), Perth (daily) and Washington Dulles (four times weekly via Dakar). All nine of these routes along with Johannesburg-Lagos, a lucrative regional route, make up SAA’s top 10 routes based on ASKs. All of SAA’s long-haul routes were previously unprofitable, prompting a review in early 2013. At the time a new strategic plan was developed which recommended four routes be cut entirely – Beijing, Buenos Aires, Mumbai, and Washington Dulles. While the South African government initially approved the cut of Buenos Aires, which was suspended in Mar-2014, there were long delays in approving other proposals and components of the new business plan. Nearly two years after the plan was first drafted SAA was finally able to proceed with the long delayed restructuring in early 2015, including the cuts of Beijing and Mumbai. SAA has immediately noticed improvements to its bottom line, stating it recorded a 45% improvement in operating profits (at an EBITDA level) in Apr-2015 compared to Apr-2014. While lower fuel prices accounted for some of this improvement, a large portion of the improvement was driven by the suspension of the highly unprofitable Beijing and Mumbai flights. SAA expects a significant reduction in losses for the fiscal year ending 31-Mar-2016 (FY2016) and to be profitable again on an EBITA level in FY2017. The group has not been profitable since FY2011. The losses have been driven by the long-haul operation as SAA’s regional international business has been consistently profitable while the domestic business also has been profitable during part of this period. As CAPA previously outlined the long-haul operation (defined by SAA as all routes outside Africa) incurred annual losses of between ZAR1.3 billion and ZAR1.6 million in FY2012 through FY2014 (USD107 million and USD132 million based on current exchange rates). SAA has not yet reported financial figures for FY2015 but the long-haul operation continued to incur large losses and the group remained in the red despite a profitable domestic and regional international operation. CAPA will analyse the position and outlook of the SAA Group (including low-cost subsidiary Mango) in the domestic and regional markets, which faces increasing competition from LCCs, in a separate upcoming report. While SAA is hopeful it can continue to be profitable in the domestic and regional international markets the group clearly needs to complete the turnaround of its long-haul operation to meet its target of becoming profitable in FY2017. Dropping Beijing and Mumbai and launching Abu Dhabi, which SAA is now using as a hub for India and parts of Europe, is clearly a step in the right direction. But SAA also needs to improve its performance across its eight other long-haul routes, all of which have been unprofitable in recent years. SAA initially sought to cut Washington as the prospects of turning around Johannesburg-Dakar-Washington Dulles were viewed as slim to none. But SAA identified Johannesburg-Accra-Washington Dulles as a better alternative which had the potential of making its Dulles operation viable. SAA was unable to previously change the stopover of its Dulles route to Accra as it lacked fifth freedom pick-up rights. South Africa was able to secure in May-2015 rights for Accra-Washington from Ghanaian authorities, enabling SAA to announce the launch of Accra-Washington from 3-Aug-2015. Accra-Washington will be served four times weekly with A340-600s while Johannesburg-Accra will continue to be served daily. SAA now serves Johannesburg-Accra daily but with smaller A330-200s and occasional A340-300s. SAA also has forged a codeshare with Africa World Airlines (AFA), which will provide feed in Accra from domestic destinations within Ghana and from Lagos in Nigeria. The feed will be relatively limited as Africa World is a small operator, with a network of only four domestic destinations including Accra and the one international destination. SAA could benefit from other partnerships in Accra. But as Ghana is a much larger local market compared to Senegal, SAA should be able to make the new Dulles flight work with limited feed. The Dulles-Accra market has been un-served since Jul-2012, when United suspended services to Ghana after two years in the market. At least for now SAA will also continue to operate Washington-Dakar-Johannesburg on a reduced thrice weekly schedule using A340-300s and A330-200s. But SAA, which has been operating four weekly flights on this route, varying between A340-300s and A330-200s depending on the time of year, could ultimately cut the route as the Dakar stop has never been profitable. SAA clearly would like to serve Dulles daily as Washington is currently its only long-haul destination that is served less than daily. Daily via Accra would not be an option at this point because while SAA has the rights to serve Dulles-Accra daily it does not have the rights to increase Johannesburg-Accra beyond seven weekly flights. As Johannesburg-Accra is a large and lucrative local market having all its Accra flights continue onto Washington would have an unbearable impact on its local Johannesburg-Accra capacity. The ideal scenario would probably be for South African authorities to convince Ghanaian authorities to increase entitlements on Johannesburg-Accra. But this will be challenging to secure even through the route is not served by a Ghanaian carrier. For Washington-Dakar to be maintained over the long run SAA will likely need feed in Dakar from regional destinations in West Africa. The Dakar stop has not worked well for SAA since a codeshare partnership ended with now defunct flag carrier Air Senegal International several years ago. SAA looked in 2013 and early 2014 at establishing a West Africa hub in Dakar as part of a potential investment in Senegal Airlines. But SAA ruled out Dakar and determined a hub in Ghana had more potential. Even a standalone Johannesburg-Dakar route may not be viable without feed as the local Senegal-South Africa market is relatively limited. Johannesburg-Dakar is an eight hour flight, ruling out the potential of using a smaller narrowbody aircraft on a turnaround basis. The other option is to have Dulles served non-stop from Johannesburg for at least some of the frequencies. But the A340-600 would be required for a non-stop flight, which SAA views as too large for the local market. SAA also has determined that it lacks the feed in Washington to support a possible non-stop flight. SAA’s performance in the Dulles market has been impacted by a 25% reduction in capacity at Dulles over the last two years by Star Alliance partner United. At the same time access to decently priced domestic seats at Dulles has become more difficult. Foreign carriers have generally seen availability of domestic feed in the US shrink as domestic load factors have increased and US alliance members have focused on their sales channels and their joint venture partners, leaving other alliance members with limited access. As a result foreign carriers have increasingly relied on non-alliance members such as JetBlue. SAA has a codeshare with JetBlue, which it uses to feed its New York JFK flights. Dulles is now primarily an end destination for SAA and SAA expects to continue to focus mainly on the local market, boosted by demand for the new Dulles-Accra leg. New York is now served non-stop on a year-round basis, opening up one-stop connections from Johannesburg to destinations throughout the US via JetBlue while similar connections via Dulles (if available) are a less convenient two stops. In recent years the flight from Johannesburg to New York was stopping in Dakar during the winter months. But SAA saw limited demand for Dakar-New York and as part of the recent restructuring of its long-haul network eliminated the Dakar stop despite the payload restrictions on Johannesburg-New York non-stops. The last one-stop flight was operated in early Mar-2015. SAA concluded the premium demand for Johannesburg-New York non-stops was worth the extra cost associated with not being able to fill up the A340-600 passenger cabin to maximum capacity and restrict belly cargo. New York is a big premium market and corporate passengers did not like the Dakar stop. Demand during the northern winter is also lower than the summer months, which meant SAA generally was unable to fill up the aircraft out of New York anyway. SAA also has seen a significant improvement to New York and its five unchanged long-haul routes – Frankfurt, Hong Kong, Munich, Perth and Sao Paulo – from lower fuel prices and aircraft rental costs. SAA renegotiated and extended leases on some of its A340s in early 2015, taking advantage of new much lower rates. SAA is now in the process of renegotiating the leases on more A340s. The A340 is currently used on all long-haul routes except Abu Dhabi and some of the London frequencies which use the A330-200. In Europe, the London route has been accumulating large losses (approximately USD30 million per year) while Frankfurt and Munich have been performing much better. London has been impacted by aggressive competition, particularly from the Gulf carriers, while competition in the South Africa-Germany market is considered less intense. The Gulf carriers serve Germany but the bilateral constraints which have been maintained by German authorities mean there are fewer available seats to Germany than other destinations including the UK. Emirates now has about 52,000 weekly seats in the German market compared to about 36,000 weekly seats in the South African market although the South African market is about one-tenth the overall size. Combined the three Gulf carriers and Turkish Airlines now have 83 weekly flights to South Africa. This will increase to 90 weekly flights in late Oct-2015 following the launch of a second daily flight to South Africa from Turkish. In comparison the entire SAA long-haul operation consists of only 70 weekly flights, increasing to 73 as Accra-Dulles is launched in Aug-2015. London is by far the most common one-stop destination for the Gulf carriers and Turkish. Emirates alone has about a 20% share of the South Africa-London market. SAA also competes against two other non-stop operators, British Airways and Virgin Atlantic. BA currently operates four daily flights to South Africa while Virgin Atlantic operates one daily flight. Emirates is currently the largest airline in South Africa’s long-haul market, slightly ahead of SAA based on current seat capacity. 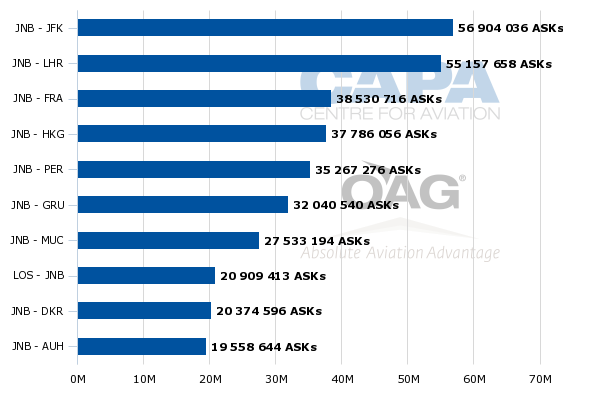 BA is the third largest while Qatar and Virgin Atlantic also make the top 10. Turkish will break into the top 10 in Nov-2015 while Etihad is smaller (currently number 14) but has a partnership with SAA. The reduction in leasing costs particularly helps the performance of the London route as both of SAA’s London flights sit at Heathrow all day, resulting in low utilisation. London-South Africa is traditionally a low utilisation route as passengers strongly prefer night flights in both directions. But SAA has since again delayed its evaluation of new widebody aircraft, making it unlikely the flag carrier will renew its long-haul fleet in the near to medium term. As a result SAA is now studying potential retrofits to its existing long-haul fleet to incorporate premium economy. But SAA most likely will determine the cost is prohibitive when factoring in the price of new equipment which may only be used a few years and the cost of aircraft downtime which would be needed to facilitate reconfigurations. One potential option would be to retrofit only four aircraft, which would be sufficient to cover the double daily London flights. But SAA believes it needs to have a standard product across its long-haul network and would therefore need to retrofit its entire widebody fleet of 23 aircraft. This would be a massive and costly undertaking, particularly as SAA is still unsure when the current fleet will be replaced. SAA has had widebody renewal as a key component of its business plan for several years, including the new strategic plan that was developed in early 2013. But SAA has repeatedly delayed the acquisition of new widebody aircraft due primarily to setbacks in securing the required approvals from its government shareholder. Most recently there were evaluations and tenders in 2012 and again in 2014. A decision on new widebody aircraft is again on the backburner until at least 2016. While most elements of the strategic plan from two years are now finally being implemented the fleet component remains a major exception. SAA expects it now may not phase out its A340s until 2020 or 2021, which gives it the opportunity to consider the 777X and A350-1000. Earlier evaluations focused on the 787 and smaller version of the A350, including a 2012 evaluation which resulted in the recommendation to purchase about 30 A350s. (The SAA board never approved or endorsed this recommendation). SAA is still looking at potentially acquiring 10 787s, A350-900s or current variants of the 777 with a potential selection in 2016 and deliveries well before 2020. But this acquisition would meet only part of its widebody fleet requirement and would not enable it to phase out its entire A340 fleet. SAA’s widebody fleet currently consists of six A330-200s, eight A340-300s and nine A340-600s. 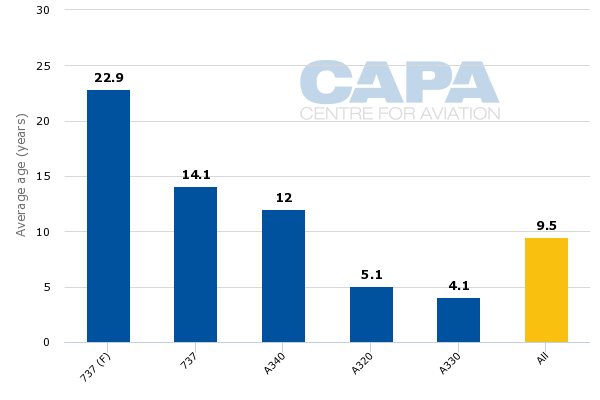 The A340 fleet is on average 12 years old while the A330s are only four years old, according to the CAPA Fleet Database. But the A330s were initially acquired as interim aircraft and were therefore leased rather than purchased, giving SAA the flexibility to replace both its A330s and A340s with new generation aircraft..
SAA’s A340-600s are configured with 42 business class and 275 economy seats while its A340-300s are configured with 38 business class and 216 economy class seats. SAA’s A330-200s are configured with 36 business class and 186 economy class seats. All the long-haul business class cabins feature lie-flat seats. SAA needs to come up with a new definitive widebody fleet plan as soon as possible. Even if it decides to wait for the A350-1000 or 777X it needs to act quickly to secure early delivery slots. SAA cannot afford to continue to delay the renewal of its widebody fleet. Securing the required approvals is a tedious and daunting process but the government should eventually recognise that a solution needs to be pursued once and for all. The government-SAA relationship is still seriously strained with the constant threat of intervention but seems to have improved with support for the current SAA recovery plan, including the letting go of highly unprofitable routes. Waiting until 2020 or 2021 to replace the A340 fleet could backfire if fuel prices spike again. Five or six years seems like a long time considering the renewal of SAA’s new generation widebody is already long overdue. Ultimately SAA’s aspirations for turning the corner will likely hinge on fuel costs. A return of higher fuel prices would make it difficult for the long-haul operation to become profitable until the widebody fleet is renewed. But given SAA’s current long-haul position, which remains challenging despite the recent network changes, it may be worth the gamble. In the second part in this series of reports on SAA, CAPA will analyse the position and outlook of the SAA Group (including low-cost subsidiary Mango) in the domestic and regional markets, where SAA faces increasing competition from LCCs. A third part will look at SAA's evolving partnership strategy.